Overwhelmed keeping track of information? Everyday caregivers and seniors struggle to organize all of their necessary health and insurance information. It can be overwhelming to keep track of all of the personal information physicians or other family members need. At Fall River, our families have found The Classic Record to be a perfect solution! Keep everything at your finger tips in one convenient location that you can take with you everywhere you go with this check-book size document. 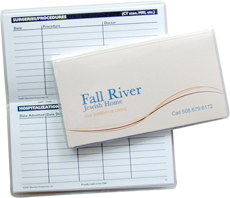 It also includes a plastic card holder for Medicare, Insurance or other personal identification cards. Fall River would like to give you this free gift because we understand how difficult it can be to manage all of the information for a loved one. To receive this free Handi Classic, please complete the information below. If you have questions, please contact us at 508-679-6172. We appreciate the challenge of being a caregiver, and we're confident you'll find the Handi Classic helpful. We will be in touch shortly so we can identify where you'd like us to send this free gift.